Real Madrid have confirmed that midfield stalwart Toni Kroos has suffered a potentially serious setback and could face a lengthy spell on the sidelines. The 28-year-old has been an influential figure for Los Blancos again so far this season, making 23 appearances in all competitions. However, as noted on the club’s official site, he has suffered a ‘rupture in his left adductor’, with further tests now set to be carried out to discover the full extent of the problem and to determine how long he could now be sidelined for. Unfortunately for Real Madrid, it does sound serious and something that isn’t going to heal quickly, and so time will tell how long coach Santiago Solari will be without the German international. As per the Evening Standard, it’s suggested that he could be out for up to four weeks. It comes at a bad time for the Spanish giants too as after their loss to Real Sociedad at the weekend, they’ve slipped to fifth place in the La Liga table and are now 10 points adrift of leaders and rivals Barcelona. In turn, losing an influential figure like Kroos is unlikely to help them get back on track as they risk falling too far off the pace to keep up with Barcelona and remain in the title race. 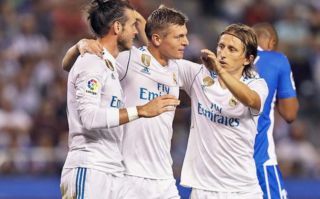 Time will tell if Solari is able to find a viable solution to cover the absence of Kroos for how ever long that may be for, but given the quality and experience that he possesses while being a fundamental piece in their success in recent years, not having him in the line-up will surely hurt them regardless.